Natural selection has often favored integrating flexible and stiff materials because they can perform better together – resisting greater forces, supporting heavier loads – than they do alone. These benefits emerge especially when the materials can occupy the same space, as they do in interpenetrating polymer networks: two or more sets of molecular-scale networks that weave throughout one another without actually connecting. But making the most of these networks also means varying the hard-to-soft ratio across space, creating a gradient. Whereas a 70-30 ratio might work best in one location, 50-50 or 30-70 could be ideal in another. 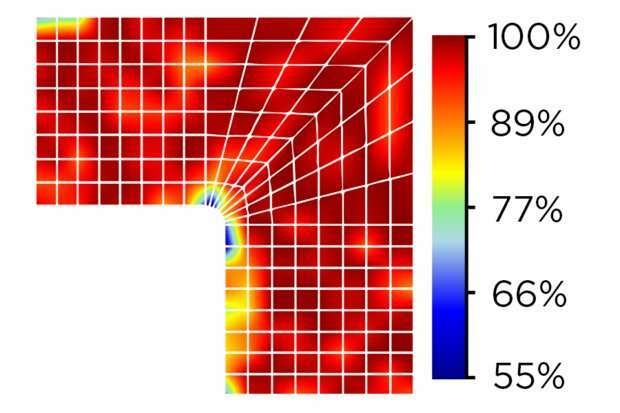 So Nebraska, French and Chinese researchers refined a model that can map an optimal gradient onto a structure while calculating how much that gradient improves the structure's performance. 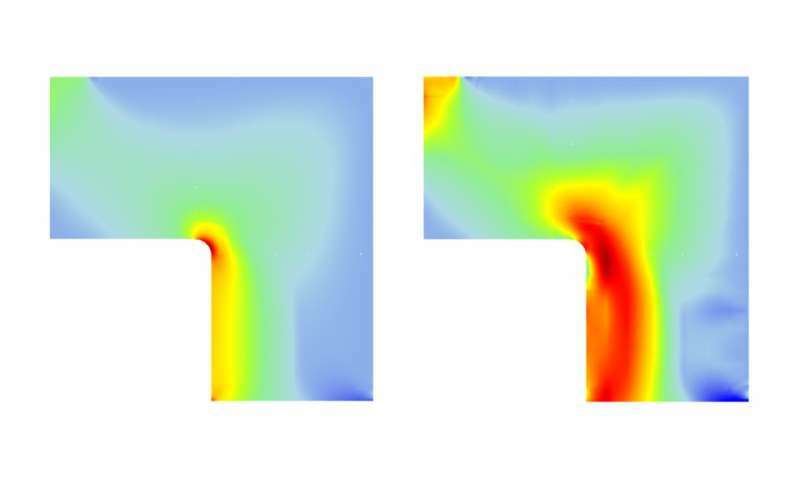 "Normally, when you mix things, they separate," said model co-creator Mehrdad Negahban, professor of mechanical and materials engineering at Nebraska. "You can think of it like an island of one material and an ocean of another material. "The island and that ocean have a boundary, and that turns out to be a material's weakest point. So two materials will essentially fail … where they're connected. But if you interpenetrate them, you don't have these weak boundaries." The team demonstrated its model by analyzing the tensile strength—essentially a resistance to being pulled apart—of a plate with a small hole at its center. First the researchers measured the strength of a plate made only from epoxy, a rigid polymer best known as an adhesive. When their model optimized a gradient of epoxy interpenetrated with acrylate—a weaker, more flexible polymer—they found that the plate's tensile strength nearly tripled. Likewise, an L-shaped bracket saw its tensile strength double after the model plotted its optimal epoxy-acrylate gradient. "We change the mixture, but the total weight is approximately the same," Negahban said. "Just by putting the right stuff in the right place, we can get it to suddenly function much, much better – that is, it's performing substantially better than the stronger component. "This could go both ways. You could use this either to reduce the weight or increase the load-bearing capability." On a fundamental level, the team's model works by overlaying a structure with a grid of up to several hundred nodes. It then assigns a ratio of given materials to each node in the grid, calculating how the resulting gradient affects the structure's overall strength. "It'll do this millions of times until it finds the (permutation) that can carry the highest load," Negahban said. As of now, Negahban said, interpenetrating polymer networks are difficult to actually fabricate. The emergence of 3-D printing has hinted at a potential approach for building components from the networks, though work remains before engineers can easily interlace polymers on the molecular scale. But Negahban said it's likely just a matter of time before a technique emerges to take fuller advantage of the model he and his colleagues have put forth. "People are coming up with different ideas of how to (incorporate) them," he said. "I think it'll happen." Negahban and his colleagues detailed their model in the journal Materials and Design.